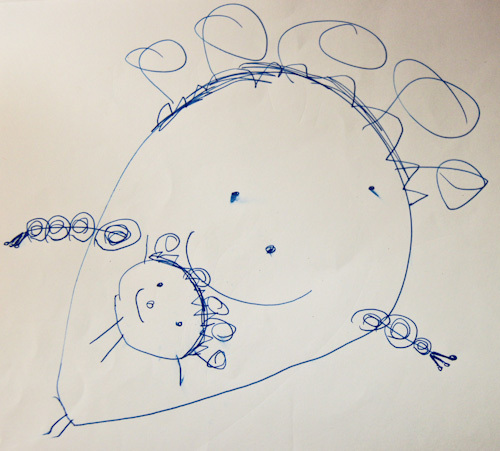 It’s been obvious for a while, so I thought I would share our family news with the online world via a cheerful drawing by Calista. Phew! I’ve been waiting. Wonderful news, congratulations!! I love the drawing! Congratulations on being a co-creator with God of another precious life! Yay! Love it when hear about such an awesome set of parents blessed again! At last the news which I was sure you could not contain for TOO much longer!Of course I hope that you will be in Aust.for the birth….will be glad to help dad the big sisters in any way I can….love to all. Congratulations – what wonderful news! Congratulations! That is wonderful news. I hope you have been feeling well. I look forward to reading how your adventures continue with a new little one.